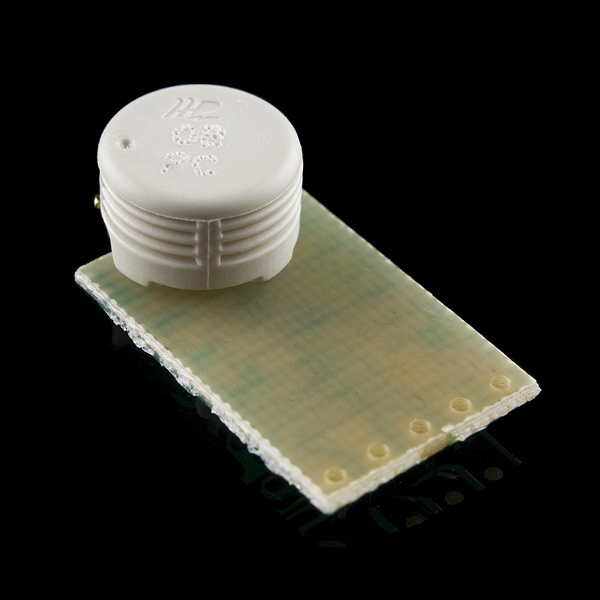 The HH10D relative humidity sensor module is comprised of a capacitive type humidity sensor, a CMOS capacitor to frequency converter and an EEPROM used to hold the calibration factors. 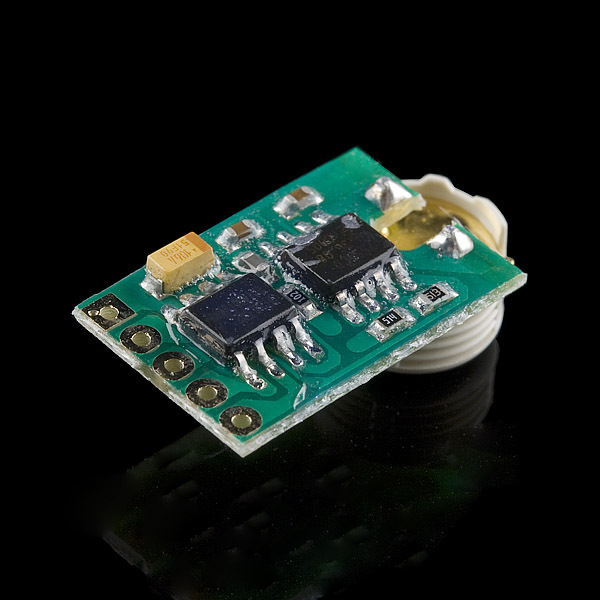 Due to the characteristics of capacitor type humidity sensor, the system can respond to humidity change very quickly. Each sensor is calibrated twice at two different accurate humidity chambers and two unique sensor related coefficients are stored onto the EEPROM on the module. ...from my experience that should mean it works like a charm, lol. The Arduino Article link draws a 404 error - in Russian. Because I'm a stickler for code clarity I put together a library for this module: https://github.com/crackmonkey/arduinolibs/tree/master/HH10D It works in interrupt mode on my Fio v3 (after stealing WInterrupt.cpp from teensyduino) as well as using pulseIn for less accurate readings if you don't have a free external interrupt to use. It can also optionally read the calibration constants from the EEPROM, but if you set the constants manually Wire doesn't get included in your sketch. Semyon Tushev did the real work, I just beat it into a prettier package. Great Product! The board came as a GREEN board, just as shown in the picture! One thing you'll notice about this board is the solder pads are not through-hole plated. This might account for some of the problems people are seeing -- it's going to be rather difficult to get good connections by pinning it down to a breadboard. It wants to have a connector soldered on it first. Well I connected it to an arduino, and the output is very noisy, it's changing for 1% RH or 2% RH even after averaging 5 readings. is the sensor faulty? How could this be used with a raspberry pi? I post a comment here because i try this sensor with an Arduino Uno and i can read the Cal data without problem but it is impossible to measure the frequency on Fout pin. I use a FreqCounter library finding on internet which use timer1 and pin D5 for external trigger. I don't have any oscilloscope but with a simple multimeter i measure 1.7 V on Fout pin and 0V when connected to D5. Is any adaptation needed ? I spent several hours trying to get mine to work to no avail. I saw someone mention that they got one that had bad cal constants in EEPROM (I'm reading 0s out of the four bytes where the cal constants should be). I ordered another one to see if it has the same problem. I'm also seeing that on about 10 feet of twisted pair (with the other line at +3.3V), the frequency isn't stable -- it drifts by a 1000 Hz in a stable atmosphere. The output impedance of the circuit looks like 1k, so that's confusing -- I'd expect that would be enough drive. When I get a chance to put it on a scope, I want to see what the signal looks like at the micro. As an aside, the BMP-085 I have is stellar. The first of these sensors lasted about a year and then started to drift. Saturated humidity remained, but lower humidities started to show higher and higher frequencies. I replaced it in mid-September 2012. Having written the above a week ago, I wanted to follow-up. While the cal data in the device seemed wrong, I was able to figure out cal data on my own. With that, I've had really good luck. The frequency drift went away when I moved the sensor away from my laptop and hooked it up to another PC. I don't have a root cause as to why. Go to weather underground, look for weather station KWIAPPLE11! My sensor is at 100% RH at about 7925 Hz. At 0% RH I'm at 6565 Hz. I got this by comparing my measured RH with data from a nearby weather station. Plot frequency versus RH. Write the equation! Has anyone here had any luck getting this to work with the Netduino? 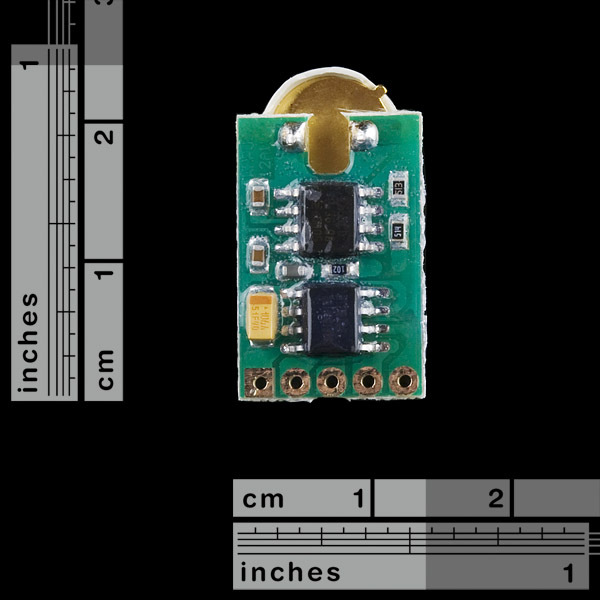 Device i2c address is 81, not 1 as specified in datasheet. Right now I'm running mine off about 30 meters of cable. I'm using an Arduino. I've noticed that if I power the Arduino off my laptop's USB port (rather than a wall transformer) I have trouble. Has anyone actually tried to package this for use outdoors where an RH measurement might be interesting? How do i switch to other I2C slave if i have more? I'm not seeing any XCLR outputs. Also, what is FOUT for? 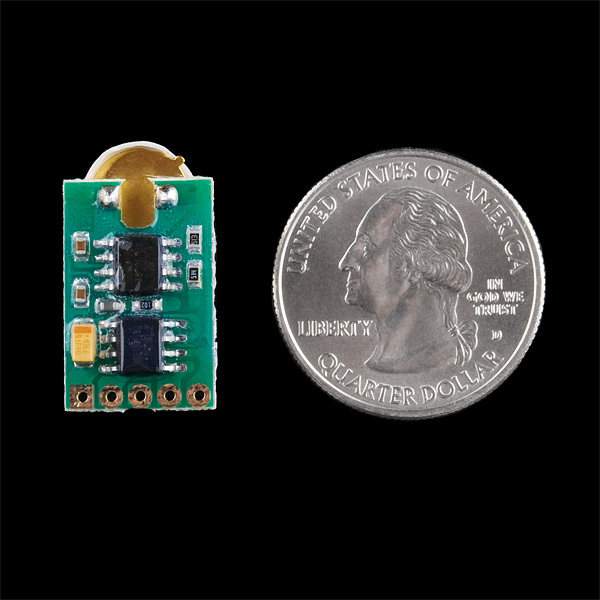 I want to know this too as I'll have more than one I2C devices connected. I'm wondering if I can cut and/or solder through that shiny crud that's covering the PCB to adjust the I2C address. If that doesn't work, I'll have to read these values out and store them elsewhere, ignoring the I2C lines in my application circuit, and missing out on the chance to use the EEPROM for other stuff. that epoxy is necessary, as this device may work in areas with high RH, to prevent shortages from condensed water. In my device, however, there's no epoxy around interface pins. You can solder it without any problems, and then add your own water insulation.